When it’s late summer or early fall and eggplant, sweet peppers, and zucchini are still everywhere you look, ratatouille is an obvious choice. Obvious or not, on its own, ratatouille isn’t always very exciting. However, when the vegetables are chopped and oven-roasted and then nestled into the middle of buttery, flaky pastry, it becomes something very worth talking about. This is from The Fresh & Green Table which continues to deliver one great dish after another as I cook through it. When I first saw this in the book, I knew I’d be making it before eggplant season ended. As the vegetables are roasting, you can decide how far you want to take them depending on whether you want a completely tender ratatouille or one with some texture. But, I have to say, once they’re in the tart along with the goat cheese and parmesan, they’ll be delicious no matter how they’re cooked. After chopping eggplant, zucchini, sweet peppers, and red onion and halving some cherry tomatoes, everything was tossed with olive oil, seasoned, and roasted for about 30 minutes. Meanwhile, the pastry was made and left to chill, and it could be made in advance and refrigerated for a couple of days. The dough was rolled into big circle, but it doesn’t need to be precise. Some shredded parmigiano reggiano was strewn about in the center and topped with some of the roasted vegetables. Chopped mint was suggested, but I used basil intead, and some was layered on top of the vegetables. Next, crumbled goat cheese and more parmesan were added followed by another layer of vegetables and more basil. The dough was folded up and over the edges and brushed with egg wash. The top of the tart was sprinkled with more parmesan, and I added a pinch or two of flaked sea salt before popping it in the oven. This was one of those crusts that shatters in the loveliest way as a knife slices into it. It was rich and crisp and golden and made an excellent vehicle for the ratatouille. So, if you’re like me and feel ratatouille lacks pizzazz all by itself, you should definitely consider using it as a filling for a savory tart. I am a member of the Amazon Affiliate Program. A fabulous galette! It looks so colorful and flavorful. This is just gorgeous, Lisa! A perfect way to showcase roasted fall vegetables. Roasted and caramelized and tucked into a buttery crust is the way to go. What a dazzling tart, bursting with the early flavors of fall. I'm tempted to give it a try and add some butternut squash to the mix, with sprinkling of thyme. A sublime recipe for a tasty dinner. gorgeous tart, sounds so delicious! This looks so delicious. Would be perfect for dinner tonight. I might just have enough time too! This is beyond delicious! Amazing colour and flavour. Did you leave out the onions and mint? Thanks for reminding me! I forgot to mention the onion, and I actually used basil instead of mint. I'll update the post. Thanks for getting back to me. I think the basil is a great choice. 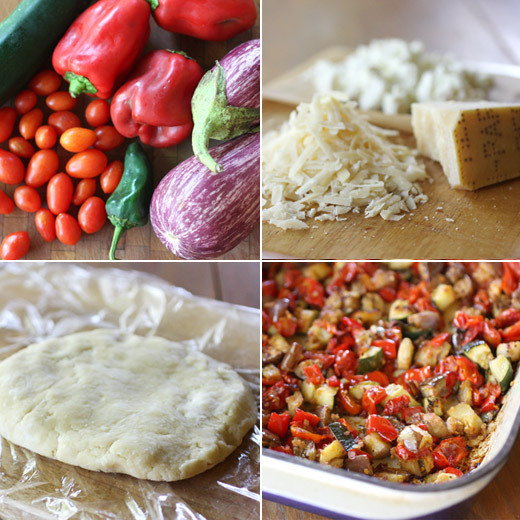 I'm not always inspired by traditional ratatouille, though I love all the ingredients. 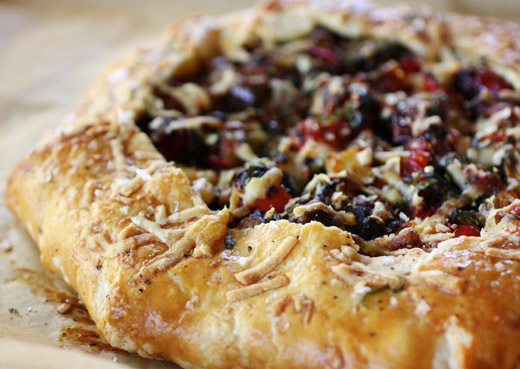 I think your flaky tart dough and the yummy cheeses look like just the right partners to turn the classic roasted summer veg into a dreamy tart. Yum! Congrats my friend, I have given you a double whammy of awards! This is the first time I see ratatouille presented as a savoury dessert - looks gorgeous! 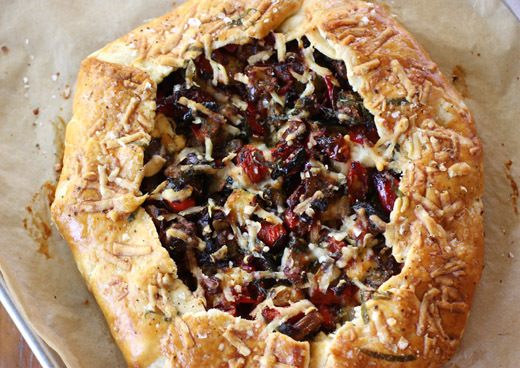 What a gorgeous savory tart! This looks incredible! Comforting tart Lisa. Rich in colour and in flavour. As soon as I read the title of your recipe, I knew it must be from the Fresh and Green Table! There are so many great recipes that I can't wait to try, and this one is near the top of my list. I like just about anything baked in a tart crust. I've never tried a ratatouille tart but it looks fantastic! Must check out this book. By the way your Irish bars are looking awesome too! This fall makes me want to bake more! ooooh! love this, but you knew I would!!! I'm loving that book too. What a gorgeous tart! I'm having some friends over for dinner on Friday night and have been trying to decide what to make. This might be it! my gosh, what a creative idea: ratatouille in a tart.